Resler Memorial Lecture is text. Its dimensions are 5 in. x 7 in.. It was created on Saturday, December 6, 1980. Congregation Beth Tikvah is the Contributor. This program documents one of the annual Jack Resler Memorial Lecture series. 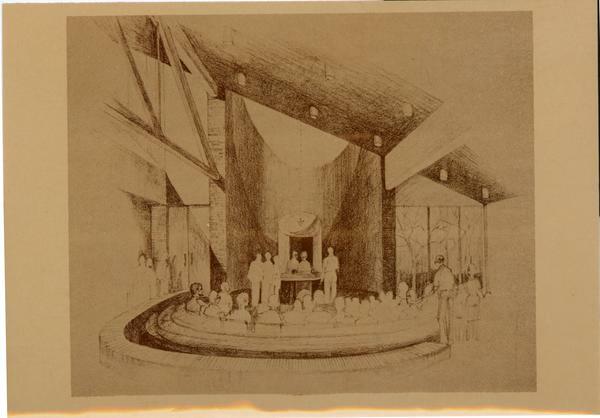 Jack Resler was a strong supporter of Reform Judaism in Columbus, and his substantial donation towards the costs of the new building for Cogregation Beth Tikvah at 6121 Olentangy River Road allowed the Congregation to go ahead without the encumbrance of a mortgage. A plaque at the main entrance honors him. 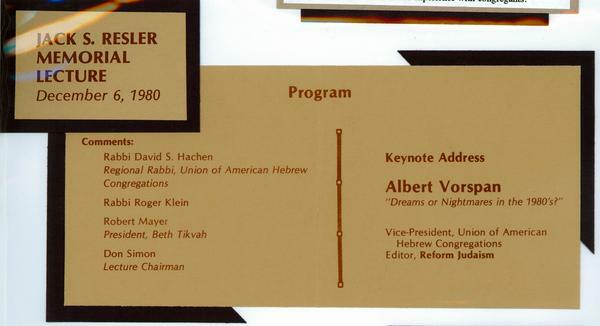 Beth Tikvah's annual lecture series was named in Jack Resler's memory. Each year, a nationally prominent speaker is brought to Columbus to share wisdom and experience with congregants. It covers the topics programs, memorials and synagogues. It features the organization Congregation Beth Tikvah. You can find the original at Congregation Beth Tikvah. The Worthington Memory identification code is cbt0016_001. This metadata record was human prepared by Worthington Libraries on July 22, 2003. It was last updated November 30, 2017.